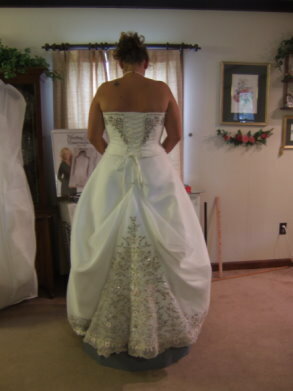 An American bustle also referred to as an "outer bustle", has hook and loop sets or button and loop sets that are sewn on to the outside of a wedding gown. with corresponding loops. Then loops are added lower on the outside of the dress to lift the train up off the floor or have just a sweep of the train still dragging behind. 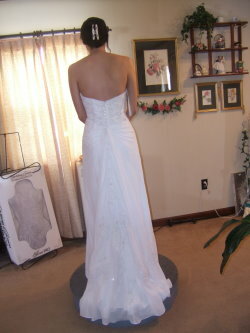 If hooks are used they are usually hidden under lace or pleats in the back of the gown so that they don't show. 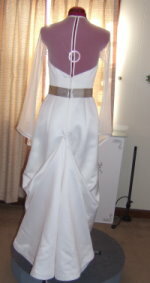 Or if the hooks can't be hidden then covered satin buttons that match the wedding dress are used. 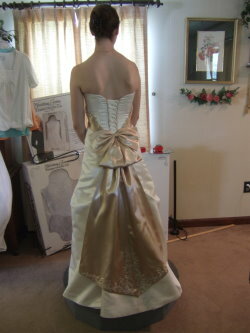 The American style bustle can be done with as little as one point or it could take up to nine or more points. Most gowns these days don't have the long chapel and royal trains of the 90"s which took a lot of bustle points to lift it up. Now most trains are shorter and can be brought up with about 4 to 6 points. "American bustles used to have many points because the trains were cathedral or longer in length. 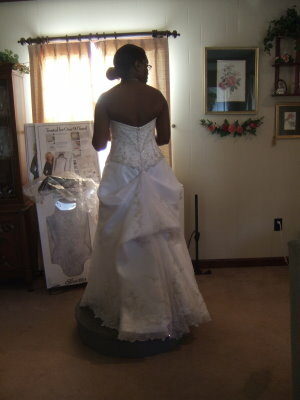 They stuck out adding poufs to the back of the gown as pictured on the left. 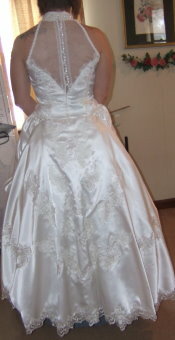 This bride came to me in 2009 to restyle her mother's dress. 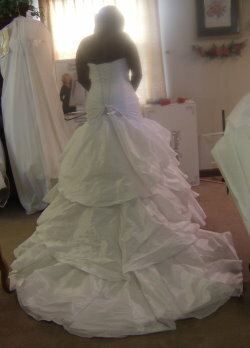 One thing we changed was to update the look of the bustle to make it look a little flatter, which you see on the right." 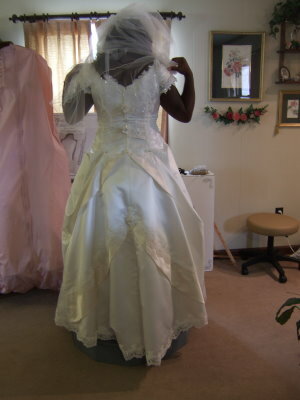 Below are pictures of some of the American style wedding dress bustles I created for my bridal alterations clients. This was a shorter chapel length train that bustled lower at the back. 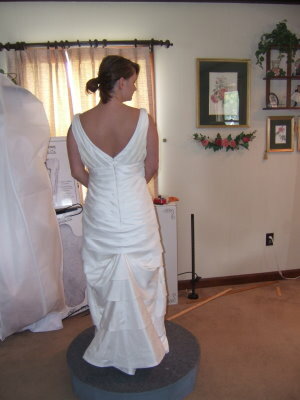 This is an American style bustle of a fishtail train on a trumpet style gown. "Trains with sheer overlays can be bustled together or sometimes have to be detached and bustled as separate layers." This is the one point butterfly American style bustle. 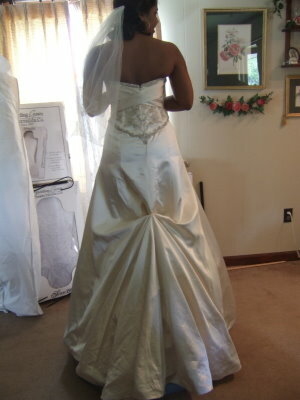 This bride wanted to show off the detailed embroidery on the train of her gown. Simple button up one point American bustle. 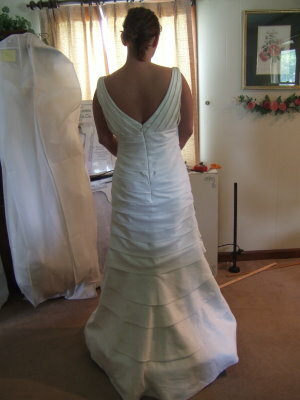 This American bustle style was pulled up under one of the ruffles. You can see the difference between what the dress looked like before it was bustled and then see the after using the American Bustle style. "Now this gown had beautiful pink bands decorating the back of the train. I wanted to make sure that showed off once bustled. The result is what you see above. The bride was thrilled!" 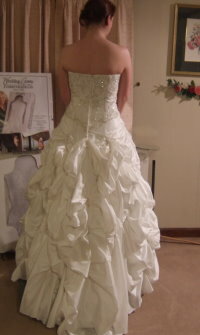 "This dress had a beautiful ruffled train. This dress was bustled under the top ruffle using an American bustle." You probably have concluded that the bustle style you choose matters! 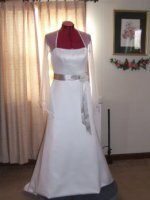 Your bustle design need to work with your gown design. 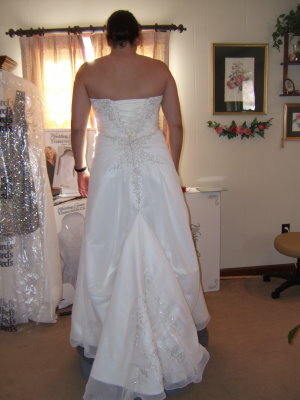 Choose the wrong bustle type and you lose some of your wedding gown style. Below you will see a gallery of other American style bustles. The outer bustle is tucked up under the decorative over drape. This butterfly American bustle style has folds of fabric that fan out which can be pushed tucked in. "It's important that when you have decorative tails to make sure the bustle works with this design detail and not detract from it." 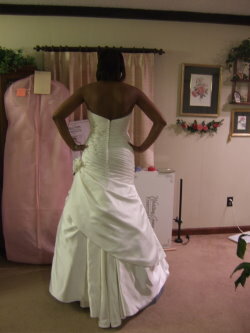 The above dress is a picture of a pick up style wedding dress that was bustled using the outer bustle. 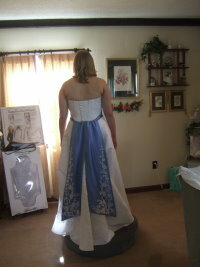 This is a bustle that has to styles combined. Here you see and American bustle style combined with French bustle. 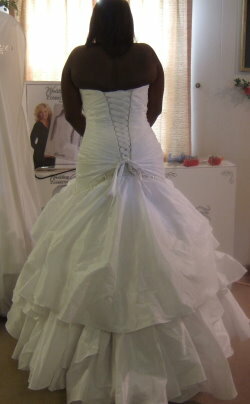 So as you can see... there are variations of how the outer American style bustle looks when it is bustled. 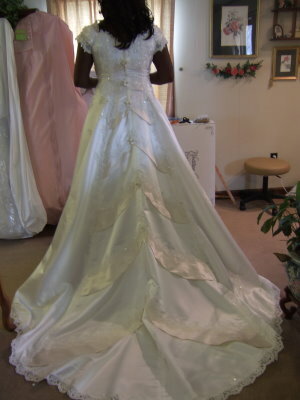 The way it looks depends on the length of the train, how high it is placed and the number of points used to hook it up and the design of the back of the wedding dress.